contrast, second-century and later gospels tend to fall into two categories: “sayings—gospels” (favored especially by gnostics) and religious novels (what we usually call the apocryphal gospels). Gnostics belonged to a stream of thought that played down the body (hence Jesus’ incarnation, earthly life, and bodily resurrection). 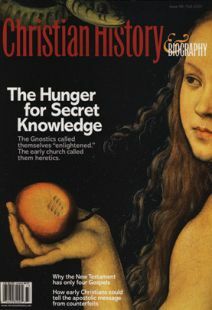 Their tastes ran more to secret teachings for an elite—what we find in most gnostic gospels. Irenaeus distinguished the canonical Gospels from gnostic ones with the observation that the four Gospels focus on Jesus’ death and resurrection, and that the writers root their claims about Jesus in references to Hebrew Scripture. Gnostics were not willing to do this.